If the ambitious plans by the Govt. of Kerala are turned to reality, then the state will soon turn into the first true Silicon Valley in India. Too tall a hope, some would say, and even I'm not so freak an optimistic to dream that Kerala would threaten the throne of Bangalore, the undisputed Silicon City of India. Numbers make the fact clear; Bangalore employs 6 lakh software professionals and Kerala just over 25,000...comparing Ferrari with Maruti 800 eh? Kerala plans to follow the Bangalore success story in its own unique way, by spreading the IT wave all across the state. The state has adopted a unique scheme to augment and disperse its IT development instead of the single-city oriented method adopted by our neighbouring states. In other words Kerala plans to become the first real Silicon Valley in India, adopting the same pattern of development of the Californian blue chip valley. Silicon Valley in California encompasses the whole of the northern part of the Santa Clara Valley consisting of as much as 25 cities and counties. With a population of 2.4 million, the Silicon Valley is home to the giants of the hi-tech industries like Apple, eBay, Google, Cisco, Intel et al. It unofficially stretches to about 150km from San Francisco to Gilroy and another 100+ km from San Jose to Union City and beyond. In simple words, a colossal continuous techno-corridor. This is exactly what Kerala hopes to emulate...a continuous urban conglomerate dotted with hi-tech industrial havens at regular intervals. The hub-and-spoke model, as they call it, envisages mega IT Parks at hub-cities and associated technology parks at neighbouring districts. Arguably a greener model of development; also a balanced and sustainable one, if everything goes according to plan. There are obvious advantages and drawbacks to such a structure, especially in the IT world. Advantage being that our cities would be relieved from a permanent market-day scenario as in Bangalore or Chennai, where the roads to these Software Parks are chronically plagued by gridlocks. Concentration and load of pressure on the infrastructure could be well dispersed and the cities will be more equipped to catch up with the necessities. And development would reach out to all corners of the state, instead of intensifying in a single city or region. As per the blueprint, there will be 3 Technology hubs in the state. The Technopark in Trivandrum, Infopark in Cochin and the upcoming Cyberpark in Calicut. The Technopark is already the biggest IT Park in the country in terms of built-up space and employs over 18K professionals. Infopark, around 200km from Technopark has grown pretty quickly in its short tenure so far, and is going to harbour the much touted Smart City in its premises. The Cyberpark in Calicut is still in the womb, and is also located at about 200km from Infopark. The idea is to develop satellite centres to these 3 IT hubs and allow development to spill into neighboring districts. 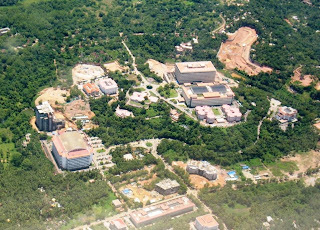 The Technopark, nestled in 375+ acres of evergreen land is getting a sibling in the name of Technocity, a massive 500 acre park, threatening to outdo the big brother in all aspects. The third IT Park will be developed in Kollam district, 50 km from the Technocity. Plans are afloat for a Trivandrum- Kollam infrastructural corridor, and these 3 technoparks will form the nucleus of the development. Already the stretch of NH 47 along this Technopark-Technocity corridor is witnessing unprecedented boom and a handful of private technology parks are slated to appear along this corridor. Inforpark will be the hub of developments across 5 districts in Central Kerala. Apart from the Smart City which promises nearly 1 lakh jobs, there will be 3 more technology parks coming under the Infopark brand; 2 each in Alappuzha district and 1 in Trichur district. The triplets will be at a radius of 75km from Infopark and will be christened Infopark-Cherthala, Infopark-Ambalappuzha and Infopark-Trichur, after the places they will be born. Ernakulam district which houses the Infopark is already on the overdrive with over a dozen massive IT-related projects up its sleeve. This region is expected to throw up anything over 2.5 lakh blue-chip jobs when the proposed developments are realized. Cyberpark, the new yet-to-be-born kid on the bloke is all set to regroup the surging hopes of Malabar. This small 68 acre affair has already started making waves in the regional real estate front. Cyberpark will come up along the newly opened NH 17 Calicut Bypass, and the space has already been reserved by IT companies. This development is a crucial shot in the arm for Calicut city as well, which was forced to take the back seat in Kerala IT development. A major commercial centre and the capital of the Malabar region, Calicut has all the necessary ingredients to become the third software hub of Kerala. Cyberpark, once up and running, will have associated centres in Kannur and Kasargode districts. The Calicut International Airport, IIM-Calicut, NIT-Calicut and the proposed Kannur Airport will add to the advantages of this region. Such a model of development enhances the growth of local IT entrepreneurs like UST Global, IBS and co as we could provide easy low cost start-up options for the newbies. Local economy will flourish all around the state. This model could also reduce the attrition levels in the companies as the professionals get increased chance to work near their native places. Development of infrastructure is quintessential to the success of this style. There should be quick, hassle-free and efficient modes of transport from one end of the state to another. Cities must adapt themselves to the requirements of the young professionals, and Kerala must shed its orthodox and archaic mindset against industrialization. A new work culture must evolve, devoid of hartals, nokkukooli and other menaces which hinder development. It will be interesting to see how this model works out, say in 15 years time. Trivandrum, Cochin and Calicut would've established themselves as IT heartlands but the growth in the associated small centres remains to be seen. But the officials in charge seems confident; it will be slow but sure! So is this the start of another Kerala model of development?